Occupying a Generous Corner Plot & Offered in Excellent Decorative Order. Generous Lounge, Dining Room & Study/ Bed 5. 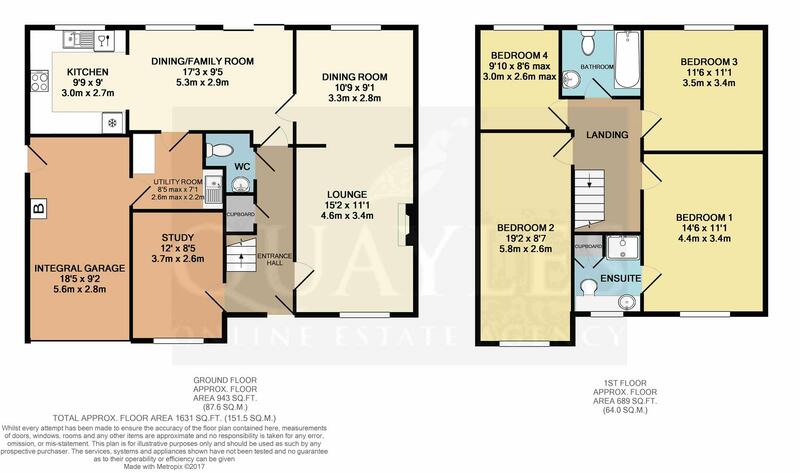 4 Good Size Bedrooms (Master with Stylish En Suite) plus Family Bathroom. Mature, Enclosed Rear Garden with Lawn, Patio & Wooden Shed. Travel into the village in a northerly direction passing the primary school and village pub. Turn left into Station Road and continue ahead taking the second left into Shore Road then first left into Cleiy Rhennee. Turn right at the junction where the property will be found on the left. Decorative half double glazed wooden entrance door and uPVC side light. Stairs lead to first floor with a storage cupboard beneath. Doors to study, lounge, kitchen and cloakroom WC. Coved ceiling. Smoke detector. Having a uPVC window to the front elevation. Ceiling cornice. Television and telephone point. A bright and spacious room with a uPVC window to the front elevation. Feature fireplace with an inset electric fire. Ceiling cornice. Television, telephone and satellite points. Clear opening to the dining room. A good size room enjoying a pleasant outlook over the garden. Door to kitchen. Coved ceiling. Naturally separated into two areas and having quality 'Karndean' floor covering which continues to the kitchen and utility. A uPVC window overlooks the rear garden whilst sliding patio doors lead out to the patio. Coved ceiling. Telephone point. Doors to the utility room and reception hall. Clear opening to the kitchen. Fitted with a good range of 'limed Oak' fronted wall and base units with contrasting background tiling and laminate worksurfaces incorporating a 1 1/2 bowl stainless steel sink with a swan neck mixer tap. Built in electric oven and 'Hotpoint' 4 ring gas hob with an extractor above. Integrated fridge and freezer. 'Neff' dishwasher. Natural light provided by a uPVC window to the rear elevation. Base unit with an inset stainless steel sink and drainer. Space for a chest freezer. Coved ceiling. Coat hooks. Space for a free standing unit. Door to the garage. Tiled to mid height and fitted with a modern white suite comprising WC and hand basin. 'Addvent' extractor fan. 'Karndean' floor covering. A spacious area with a built in linen cupboard and access to a fully boarded loft. A particularly long double bedroom with a uPVC window to the front elevation. Fitted shelving. Ample power points. Television point. A large single room having a uPVC window to the rear with distant mountain views. Ample power points. Television point. Fitted with a modern white suite comprising low level WC, pedestal basin with tiled splash back and shaver point. Panelled bath with mixer shower attachment and tiled surround. Glazed shower screen. Vinyl floor covering. Extractor fan. Obscure glazed uPVC window. Fitted with a contemporary white suite comprising WC with a concealed cistern, base unit with a top mounted circular basin and a mirror fronted cabinet. Shaver point. Recessed enclosure with 'aquaboard' backing housing a fully plumbed shower with an additional over head rose. Built in cupboard. Chrome heated ladder style towel warmer. Obscure glazed uPVC window. Recessed downlights and 'Silavent' extractor. Washed oak effect floor covering. A good size, enclosed garden. Mainly laid to lawn with mature shrubs and close boarded fencing. Large patio area ideal for outdoor entertaining. An additional paved area to the side provides a discreet location for the timber shed. Gated access to the front of the property. 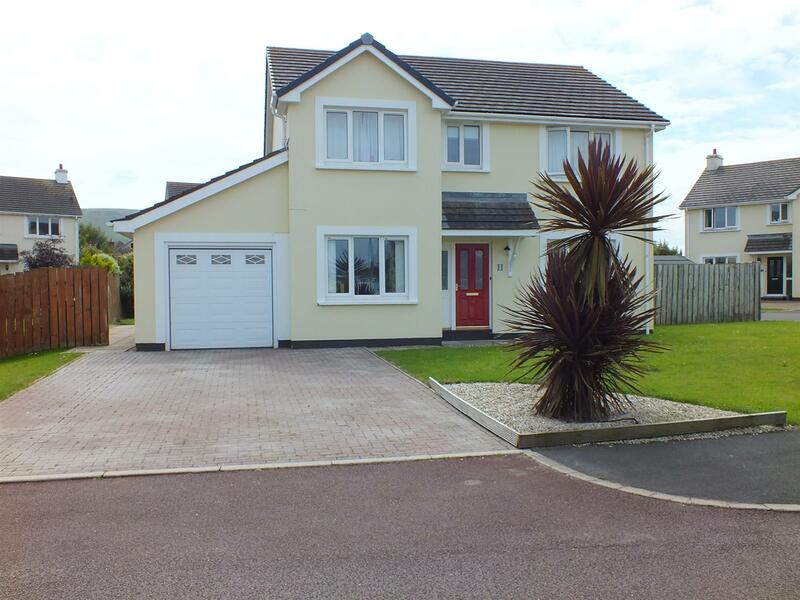 Mostly laid to lawn with a long, wide block paved driveway which provides comfortable off road parking for four cars and leads directly to the integral garage. Having an electronically operated up and over garage door. Half glazed door to the side of the property. Energy efficient 'Alpha' gas fired condensing boiler. Space for a fridge freezer and tumble dryer along with plumbing for a washing machine. Light and power points. All mains services are installed. Gas central heating and uPVC double glazing.